This will probably be the most controversial post I make on this blog. I’m actually going to make the case AGAINST building with shipping containers. Over the past several years I have corresponded with a fair number of people wanting to build a home or cabin out of shipping containers and, believe it or not, many times I try to talk them out of it. It’s not that I regret what I’ve done (I don’t), it’s just that I only see a limited number of reasons to build with shipping containers. There are only two good reasons, in my mind, to build with shipping containers. The first is for security, which was my sole reason for embarking on this project. The second is to make an “architectural statement”. At one time I thought there was a third, such as a situation where you could get containers for free, but now that I’ve run the numbers that scenario doesn’t pan out. I’m sure you might find other unique situations, such as wanting to build a cat 5 hurricane-proof structure, but in most cases it doesn’t make economic or practical sense. You may have noticed that I didn’t mention the environment. The vast majority of cabin builders are more concerned with practicality and cost than green construction. It’s not that they don’t care about the environment, it’s just that they don’t want to spend more than they have to for the latest, sometimes dubious, green building technology. I also don’t see re-purposing containers as a great environmental panacea in most circumstances. Shipping containers are best used for what they were originally designed for – the shipping and storage of goods. By the time a container is no longer able to do that effectively, I’m not sure I’d want to build with it anyway. If you feel the need to reduce your environmental impact, build small and insulate well. I know I’m going to get comments like “I can build a container cabin for $20/sq foot” or “your cabin is overbuilt and too expensive”. Both of these comments are true if you don’t mind living in a shack more appropriate for a third world refugee camp. I’ve seen shipping container “cabins” with no insulation, the wrong insulation, raw plywood flooring, no wallboard or paneling, no roof, no foundation, and no utilities. If all you want is a metal box lying on the ground then yes, shipping container construction can be both easy and cheap. To be fair, those in warmer climates can get away with much more than I can in the northern US, so let’s just consider this discussion applicable to temperate climates only. 1. Security. In my opinion, this is the greatest strength (no pun intended) of shipping container construction. I can’t think of an easier way to incorporate passive security in an above ground structure. The only other reasonable option would be a concrete building with a similar style metal door. I’m under no illusion that I’ve built some kind of Fort Knox. There are several relatively easy ways to break into my cabin; it’s just that it will take a far greater level of effort to do so than compared to a conventional structure. My old cabin could be broken into in approximately 10 seconds with nothing more than the boot on some miscreant’s foot. This one would take about 10-20 minutes with a cutting torch or the right power tools. If someone is going to go to that level of effort, they’re going to be disappointed by what they don’t find inside. 2. Architecture. I’m only going to touch on this briefly. I have seen some absolutely unique and beautiful shipping container cabins, although some of the most unique among them would be difficult to live in. I have nothing against creating a structure for the sake of art, but that is beyond the scope of this usually practical blog. For those who build for the sake of art, cost and practicality is seldom a concern. 1. Cost. One of the more common misconceptions prospective builders have is that building with shipping containers will be less expensive. I’m here to tell you it’s not, especially if you want something that lives like a real house or cabin. I’ll compare the construction costs of three similar cabins; my container cabin, my container cabin if it had been built with used containers and a pier foundation, and a cabin built using conventional materials. My 480 sq ft (external dimensions) shipping container cabin, fully furnished, cost nearly $36,000 ($75/sq ft) to build. The only construction extravagances in this build, at least to me, were the new (one trip) shipping containers and a purposefully overbuilt foundation. The costs also included several thousand dollars spent on contractors, but I would have had to spend that with a conventionally built cabin also – I’m trying the best I can to compare apples to apples between the three builds. Next is the scenario of building the same cabin with used shipping containers and a pier foundation. There’s really not much difference between the price of new (one trip) and quality used containers. I can purchase a new 20′ container right now for $2,650. The lowest priced used containers that I’d be comfortable building with are running about $1,500. I might also save a few hundred dollars on shipping since I could probably get them locally, but overall I’m only saving about $3,900 with the used containers. If your soil is appropriate for concrete piers, you can definitely save some money compared to my foundation. In my location, I have had such ongoing trouble with concrete and wooden piers heaving that I would never trust them for a permanent structure. Another advantage to piers is that they can be a do-it-yourself proposition, if you are skilled enough, which could save you even more. 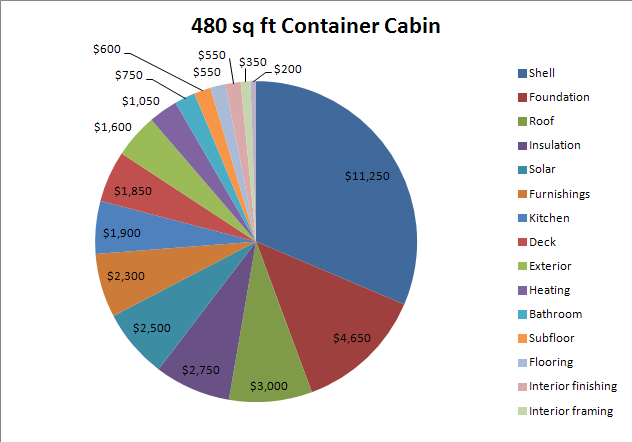 The final cost of my cabin with used containers and piers would be about $29,000 ($60/sq ft). I’ll also include the scenario of using free shipping containers with this build. Even if you were fortunate enough to find three shipping containers for free, all of the other associated costs such as shipping, crane rental, welding, and reinforcement, would still be required. Due to this, the free shipping container scenario would still cost about $24,500 ($51/sq ft). Now we get to the interesting comparison with conventional construction. 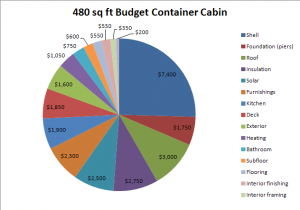 Please keep in mind that some of my numbers might look strange, but I was trying to keep the cost categories as similar as possible to the container cabins. For example, a conventional construction shell would typically include the roof, but I had those costs separated out with my container builds. The big savings for this cabin were in the shell (walls) and insulation. Building a shell with 2×4’s, OSB, and siding is so easy and inexpensive, at least in my part of the world, it’s hard for anything else to compete. You also have to consider that a shipping container shell still needs to be framed inside for attaching wallboard or paneling. This essentially turns the shipping container into very expensive siding if you don’t need its security. For insulation I priced it with fiberglass batts for the walls (R13) and ceiling (R25), and extruded polystyrene foam panels for the slab. I wish there was another, more cost effective option for insulating shipping containers besides spray foam, but there really isn’t. 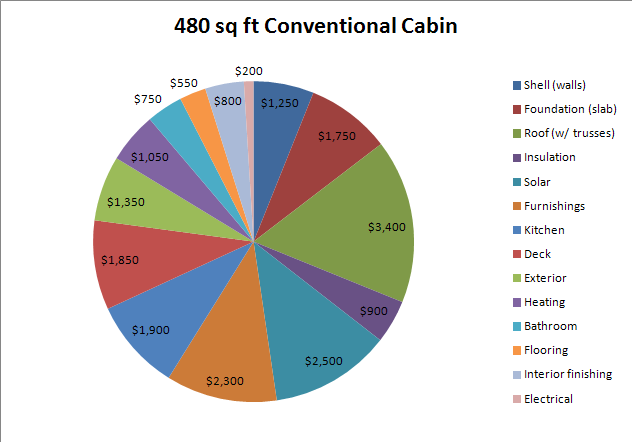 The total cost for a conventional material version of my cabin would only be about $20,500 ($42/sq ft). The bottom line is that I spent an extra $15K just to build with shipping containers. I’m very fortunate to have an understanding wife. 2. Difficult construction. Having built cabins with both conventional materials and shipping containers, I can tell you that building with conventional materials is far easier. Normally straightforward tasks like electrical, plumbing, painting, and trim work can take several times longer when working with containers. This is potentially a hidden cost that’s not shown in the cost figures above – keep this in mind if you plan on hiring out a lot of the finish work. 3. Local approval. A common question I’m asked is “how did you get it approved?”. The answer is that I didn’t have to. I’m fortunate to be in a somewhat remote, forested/agricultural area with a fair number of questionable hunting cabins and farm outbuildings. I did get a building permit, for all of five dollars, but the township seems to care more about taxes than construction. Most builders won’t be so lucky, and it’s usually quite difficult to get approval for a non-conventional building such as this. 4. Treated plywood floors. While this wasn’t a deal breaker for me, there are those who will shy away from using containers because of this. Since I was only building a weekend cabin, I encapsulated my plywood floors with epoxy and I feel comfortable with that decision. On the other hand, if I was going to build a permanent residence I would probably replace the treated plywood with untreated. This would probably be more for resale value than anything else. Replacing the plywood floors in my cabin would have cost about $900 in plywood alone. 5. Design limitations. Designing an efficient and liveable cabin in multiples of 8, 20, and 40 foot lengths is a huge limitation. Need an extra two feet on one end to fit your dream kitchen? It’s not going to happen without taking something away from an existing space. The flexibility of frame construction to scale to virtually any size is a substantial benefit compared to container construction. I’m not telling anyone they shouldn’t build with shipping containers, just that they should truly assess their reasons for doing it before they proceed. A shipping container cabin can be comfortable, secure, and aesthetically pleasing, but it will cost you considerably more than a conventionally built cabin. It’s not that different than wanting to build a log cabin – my true dream cabin, by the way. Log cabins also cost more per square foot than conventional construction, but somehow they seem like a better aesthetic deal to me. In summary, I don’t regret my decision to build with containers. The peace of mind when I lock up my cabin is priceless – well, at least $15K worth. Please feel free to disagree with me. I do enjoy a robust, yet cordial, debate. This entry was posted in Uncategorized on December 19, 2013 by Steve. I’m glad you gave an honest evaluation of your whole building from concept to finished cabin. I have felt the cost was a lot more than traditional construction . You always hear about how cheap i bought this or that but then you also hear about all of new and extra cost’s . You can make a cheap cabin out of one and be primitive but is that what one really desires in one of these cabins or homes? Thank you for your articles and allowing us to journey with you ! Even I was surprised by how much higher it was than traditional. I tried to estimate every cost before I started building, but the unexpected costs of working with containers kept popping up throughout the entire build. I still have a couple different container projects planned for this summer where the costs will be more competitive than what I built here – stay tuned. What was your final square footage cost? Is $85-$100 a square foot be managable for a ‘home’ made from containers? My final cost, as mentioned above, was $75 per square foot. You might be able to build a home for $85-$100, but a lot would depend on the quality of materials and amenities you expect. Are you planning on granite countertops, wood flooring, central air, etc.? Do you also already have grid electric on site? If so, that’s a savings for you as $5/sq ft of my cost went for my solar power system. On the other hand, you will probably have a septic system which can easily add $15K or more to your costs. In the end, there’s just too many differences between an off-grid cabin and a typical home to make comparisons. As I ponder building a container home, in Albuquerque, I will take so much of your article to heart. As you mention, traditional construction, can vary by locality; the reason we use stucco, over bricks – cost prohibitive. Thank you for the honest perspective! container house – what have you found out ?? will ABQ allow container houses ?? What do spec builders use? Traditional wood frame construction is by far the most economical way to build…that is of course until large scale concrete “printer” homes become more feasible. Mods International is (or was last summer) selling 40 foot containers (320 square feet) converted to housing for about $32,000 each. Main selling features were security, minimum site preparation and quick installation. A target market is housing in the North Dakota oil fields. Oil patch crew housing needs to be tougher than standard mobile homes, hence the use of ISOs. I have seen the Mods units before and I think they look nice on the surface. The greatest shortcoming of these units in my opinion is the use of fiberglass insulation rather than closed cell spray foam. Fiberglass insulation in containers relies on installing and maintaining a perfect vapor barrier on the interior side. If the vapor barrier isn’t perfect, or is damaged through transport or use, water vapor will reach the outer steel wall and condense in the wall cavity. Once water is there, there’s nowhere for it to go. Due to the high cost of closed cell spray foam, there will always be the temptation to use something else. I would encourage everyone to resist that temptation and just bite the bullet for spray foam. Two inches of closed cell spray foam creates it’s own vapor barrier and typically insulates better than its rated R value. Another shortcoming is the feeling of living in a cave. Containers are a lot like Quonset huts, starting out as inexpensive, reliable, weather-proof structures for holding “stuff” which haven’t evolved into comfortable long-term living units. Sort of like “pre-fab” — it is and always will be the housing of the future. Thanks for the link. This is an excellent article that explains very well why fiberglass batts are not the right choice for insulating an impermeable metal shell. I’ve been putting together a design with an intention to use rigid foam board against the metal shell and using a light-duty spray foam tool to seal all four edges. I wonder if I’m headed for a reality-check on the feasibility of that? I’ve considered the exact same thing myself. If I was going to do it I would custom cut the foam boards and glue them into the corrugations to limit any air spaces. I would then cover everything up with a thin layer of spray foam. In the end though, I would probably still use spray foam exclusively for the peace of mind. We are going to build a 1100 sq foot guest house using shipping container, so happy to have found this site . Does closed cell spray foam insulatin have formaldehyde in it? The health risks that formaldehyde poses are pretty serious that would be my primary concern ? You would need to check the Material Safety Data Sheet of the spray foam you are considering to be sure. If you are concerned about off-gassing of the spray foam, there are soy based spray foam insulation available. The spray foam installed in my cabin had a strong chemical smell for many weeks that I would have been concerned to live with. It wasn’t a problem for me as it had a long time to off-gas before I stayed there. If I had to spray foam and move in right away I would definitely use a soy based foam. Soy based foams have very little soy in them, it’s mostly marketing. All spray foams, open and closed cell, no matter what brand you’re considering, are urethane based foams. As far as formaldehyde goes, it’s not present in spray foam but it is used as a binder in fiberglass batts. Formaldehyde free batts are available, but based on experience, I’m suspicious of how well they’ll hold up over time. Thank you for this post. Very informative. I have wondered about the true cost of using shipping containers to build a home so it’s really interesting to read your post. I’ve been looking at building a home for myself. I’ve sketched out some possible draft layouts (I haven’t looked at costs as I do not yet have a site) both using the dimensions of shipping containers and also sketching out simple small house for conventional construction. The bottom line for me will be cost and security. To accommodate my needs with shipping containers, I figure I would need 3 x 40′ containers. For me, one of the advantages would be, if you can get some work completed off-site, you might have a temporary habitable space in one end of one of the containers to work from. You could also use one of the containers as a secure workshop, tool shed and material storage area while you complete the build. You’d have good security for the tools and materials. For me, the security aspect is important, and if I was going the ‘conventional route’ instead of shipping containers. I would probably use a heavily-insulated masonry build. Or ICF’s, but that’s going to be expensive. The downsides of containers, for me, are (1) the dimensional/width constraints, (2) getting the insulation right so as to eliminate problems with condensation, (3) potentially toxic treatments used on the plywood floors, and (4) what about resale? You never know, circumstances change and you might need to sell up. Would a well-build and well-insulated conventionally-built cabin sell quicker/better than a shipping container cabin? There are some relatively easy and cost effective ways to add security to a conventional construction cabin. One of the best that I have seen is to incorporate sliding barn doors on the side of the cabin that has the entry door and main windows. You can also install an appropriate gauge of metal roofing/siding instead of traditional wood lap siding. It all depends on how much security you truly need. As for building off-site, it is possible to do some of that. Do keep in mind that you should not remove any walls of the containers until they are in place and welded together. With my cabin I could have probably only epoxied the floor and installed the internal framing. The one negative to this is that you might have to pay for shipping the containers twice – first to your home/workshop and then to your cabin location. If I had to do it over again, I would buy an extra container to use as a workshop and then re-purpose it for a container barn later. Your last comment on resale value is definitely a concern. If I ever thought I’d have to sell my cabin, I wouldn’t build with containers. Most buyers won’t pay the premium that container construction entails, and your pool of interested buyers will definitely be less. Thanks for the breakdown of your costs. My questions are from a home builder’s perspective instead of a recreational structure. For starters, what type of siding did you price for your “conventional” cabin? Personally, I consider brick to be a more fair comparison for it’s durability and strength instead of wood, vinyl, or hardiboard. That would increase the costs significantly, especially if labor was included. Also, I realize you’re showing how much less a conventional cabin could be, but factoring foam insulation back into the costs and you’re up another $1850. And simply from a sq ft perspective, one can find used 40 ft high cube containers for not much more than your cost for new 20 ft containers for those that might be considering bigger projects. 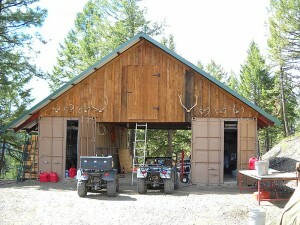 Granted, the other construction costs are multiples of your cabin in order to finish out a bigger structure. Also, do you have or remember the actual labor costs for any of the contracted work you had done and if so, could you post it? I’m still hanging on to the container home idea. Just trying to look at it from every angle possible. Really, one of the biggest cost in doing a container correctly is using foam vs fiberglass. The other big cost is the containers themselves. But when compared to brick construction, the gap narrows quickly. For the DIY’ers, unless you’re a brick mason, containers have a distinct advantage. For siding I assumed LP Smartside (Precision series strand substrate) – this is what I used on my framed cabin walls. I think this is some of the best lap siding currently available – even better than fiber cement for most situations. My primary residence happens to be brick and I absolutely love its durability and low maintenance. Even though brick is a great construction material, very few people would consider it for building a cabin. Do keep in mind that my experience and this blog is about cabins and not houses. I didn’t include spray foam insulation in the conventional build because I don’t see much use for it with a conventional construction cabin. Fiberglass batt insulation is perfectly adequate for frame construction. I’m even of the opinion that 3.5″ of fiberglass with a standard 2×4 stud wall is good enough in most cases. Since most cabins are typically used on the weekend and for three seasons, you don’t get the same level of insulation payback compared to a primary residence. Used containers are definitely more cost effective than new. You can also build a conventional cabin/home more cheaply using reclaimed materials from Craigslist or Restore. I’m also personally not comfortable building with used containers due to their unknown history – see my “The Floor Dilemma” post for my reasoning here. In regards to my using 20 foot containers, I chose these due to their greater opening to square footage ratio. Since I do not have any additional windows cut out from the container for security reasons, I can only rely on the standard container door openings for natural light. Without that limitation, a 40 foot container would make more economic sense. I did include all of the labor costs with my estimates above, but I don’t have a good way to extract all of them. The contractor estimates did not always separate materials from labor. In fact, most of the estimates were verbal and approved with a handshake – my preferred way of doing business. You’re right about DIY brick. As difficult as my container cabin was to build, brick would have been much worse. The LP Smartside is an attractive product. I was not aware of it and it looks to be pretty sturdy too compared to other products in impact demonstrations. Thanks! The spray foam IS a huge investment if used in a residence but with the impermeability of the container and the addition of spray foam, I had hoped to keep recurring energy costs to a minimum. As one guy told me, “the two together act like a thermos. Get it warm and it stays warm. Get it cool and it stays cool.” The same guy had built a couple of homes for others in the NC mountains and I believe he told me his winter electrical bill was $25 per month with electric heat but primarily using a wood stove. Mine, using electric heat, ranges from $200-260 for about four winter months in a much milder climate. I think I could easily save $1000 per year in heating and cooling costs. Are you able to maintain a consistent temperature with the combination of foam and your wood stove? As for used containers, you have to be careful when picking them out but in general, if you’re using multiple containers you really only need one with a good undamaged left side and another for the right side or in a worst case simply buy two new ones for the outsides. I think your idea with the epoxy is probably the best solution short of reflooring everything. That said, I worked in a shipping department for many years and loaded and unloaded 1000’s of containers and trailers. You can never be sure unless you buy a new one of course, but it was very rare to see where anything had leaked or spilled. The worst thing was breathing the wood dust from pallets being pushed or dragged across the floors with forklifts. The insecticides in the wood floors probably are the worst you have to worry about. One last question. I saw where you mentioned having the waterproof coating under the containers but did you ever put any insulation under there? If not, how does that effect the temperature of your floors in the winter? I don’t have any problems keeping the temperature stable with my Jotul 602 wood stove, even down to -10F. I did have some trouble earlier on when I was using double walled stove pipe on the indoor section of the chimney, but when I changed it out for single walled pipe the stove was more than capable of keeping up. During that time I did find that my two large picture windows were the source of most of my heat loss. I made some insulated panels for them that alleviated the problem, but it was a pain to install and remove them all the time. The single walled pipe was a much simpler solution. The other problem with used containers is that many times you cannot get them all from the same manufacturer. There are slight differences between the makes that would make working with them difficult. I’m glad mine were from the same manufacturer and built reasonable close together (time wise). The bottoms of my containers have 1″ of spray foam on the underside. It may not seem like much, but when combined with the 1.5″ marine plywood, 1/2″ foam insulation, 1/2″ OSB, and laminate flooring, the floor doesn’t seem cold at all. A couple of those are actually very nice. One in particular, the Cove Park in Scotland, inspired me when I was designing mine. It’s the one with the six 20′ containers side by side. Let me echo the thanks conveyed earlier for such a detailed explanation of your process. We are just beginning the journey and are committed to containers (both for security and because we are building in a hurricane and tornado zone). I had one question about treatment of the interior – did you have the containers sandblasted or anything to remove any chemicals that may have leached into the paint? Also, have you heard of container homes being built above a dug and reinforced basement? I’m not sure what kind of chemicals you’re concerned may have “leached” into the paint. Are you possibly thinking about heavy metals (i.e. lead) that might be present in the paint itself? If so, I have encapsulated all of the original paint with either spray foam insulation or several coats of latex paint. I never tested my containers for lead, but I’m not too worried about it in any case. This is no different from all the lead based paint in the homes I grew up in. As long as you don’t aerosolize the paint through sanding and breathe it in or ingest any paint chips you are fine. As for a basement, I don’t see why it wouldn’t work. The only difficulty would be welding up the openings and irregularities of the container base. I chose to forgo a basement so I’d never have to worry about water infiltration and potential mold/freezing when the cabin sits idly for several months. If it was a full time residence on the grid I would probably build a basement. Thanks for your info. I’m getting ready to retire and was looking at some hunting property in upstate NY. I thought the easy way for a cabin was a couple of 40 footers and and a plasma cutter. Time to rethink my plans. Looking for ideas and constructive feedback for a lake home guest cabin. Would be 3 season use. I would have access to electric utility. Here is where I would like feedback. I was thinking of other flooring options and considering a concrete skim coat over in-floor electric heating mesh. Would that sufficiently seal off the treated floor? or, would I have to add an additional vapor barrier to the floor as well? Most concrete vapor barriers on the market are designed to block/reduce the transmission of water vapor to the concrete. The type of vapors you’re worried about though are volatile organic compounds (VOCs) from the treatment chemicals in the plywood flooring. While a polyethylene vapor barrier might reduce the infiltration of VOCs from the flooring, there’s no way to know how those chemicals would effect the integrity of the vapor barrier itself over time. There are special vapor barriers available that do resist VOCs, but they’re probably not cheap and I don’t have any experience that would allow me to recommend one. If I were doing something such as this, I would give some thought to replacing the existing flooring. If you could replace the 1 1/2″ plywood with 3/4″, the electric heating mesh and skim coat of concrete might just bring you back up to the original floor level. You might even be able to squeeze a thin layer of EPS foam under the mesh. I think it is very cool how you continually answer questions and published your website to help others with your container building experience. I have a few questions or ideas you may be able to help me with, which other viewers may benefit from as well. I’ve bounced between Airstream mobile trailers and a shipping container cabin home for some time now, wanting to put a get away place on a 150 acre property with a perennial stream outside LA, California. I liked the aluminum, metal, shinny outer layer and less rules of just using a trailer, but on the flip side, I am concerned with very hot weather in the summer, earthquakes, fire and security. About a week ago, I became convinced after a California Airstream owner said I would not be happy having to constantly make trips to get propane to run the air conditioner under the baking sun and they leak. I added to the logic I could not really secure it where windows could be broken, rolled away or burglarized thru the aluminum door. I’ve watched videos and read how others gutted old airstream trailers down to the frame and restored them. My conclusion was I wanted something metal and fire resistant and could not be easily stolen. On the other hand I resisted the containers due to delivery in this area as it takes dirt roads to get to the property. In the videos, I watched how the metal shell of the Airstream is thin and they use a couple inches of fiberglass to insulate. I bring this up because it seems air circulation keeps coming up from viewers and it seems there has to be a solution in addition to opening doors and windows. My first question is do you think a single mini split would help, especially when heating or cooling, when the doors and windows need to be closed. I like how you left the concrete foundation open and with fire issues in California, I need something that will not burn. The land can be managed and keep clear around the home, but a lot of fires start from burning ash blowing into roof vents. So one area of concern is under the container. I love closed cell spray foam, but it is very flammable so I am concern with a fire attacking from underneath. I could close the foundation with a stone wall, gravel filled patio on the front and back. What would you put on the bottom of the container exterior floor if you were in my shoes? Example-screw steel metal sheets? What do you think of the idea of flipping the container where the wooded floor becomes the ceiling, and the roof metal seals the bottom of the open unit? I’m thinking of using metal framing studs with a metal roof with spray foam insulation. The wood floor could actually be removed and just fill in like a normal home with a plywood floor. I like how you can close your unit doors and it’s secure. Exactly what I need. Now I saw a video where a guy bought a 20 ft containers where one, large door swung open from the long side of the middle and it was built this way. I thought by place this type of container to the inside would save having to remove a wall between units, if one could live with a 12 foot door. I’ve seen one unit that is 10 feet and I wonder if there is a way to modify your unit so all the utilities and solar instruments go into the 10 foot section, leaving more space for the living area. Sorry for bouncing all over the place. Last, I was surprised you sided the your tin cabin rather than the container look. I guess it makes sense for resale and it does look nice. I concluded if I was to side, I would need Hardy cement siding since it is fire resistant. Can I ask how did you attached your siding to the container? When you created the framing walls in the front, where the windows and doors are, I can see you nailed the bottom of the framing to the wall, but how did you attach the wood 2×4 framing to the ceiling, etc. 1. Without knowing the size of your proposed building, and the amount/type of insulation, it’s hard to say if that Mini-Split would work. You really need to consult an HVAC professional for a good answer. 2. If I wanted to protect my cabin underside from fire, I’d frame the side openings and cover it with sheet metal. I’ll probably do that someday, but more for secure storage than protection from wildfires. 3. Don’t flip your container. Why take a perfectly good roof and make it your floor. A container roof is also not flat or smooth, so you would need to construct a new raised up floor as well. 4. While the side opening containers are nice, and work well with some designs, they do cost considerably more than standard containers. Removing a wall is also not that difficult, and you then have the advantage of some extra metal to play with. 5. There’s no reason you cant build a separate utility building, although that’s probably more practical in climates warmer than Wisconsin. 6. My containers are not sided – they still have all the original exterior steel. The only part of my cabin that has some siding are the three front walls that are behind the container doors. In regards to the framing, I recommend you read the appropriate section on my “How to Build” page. I forgot – I brought up the Airstream trailers because they have metal exteriors and they are closed in like the cargo shipping containers, yet there is no problem with condensation and air circulation. I am wondering if having a single mini-split would help with the circulation since both the cargo shippers and Airstreams are alike, and these are the kind of units they use, except they are on the ceiling of the trailer. I am so not qualified to comment on air conditioning. I don’t have air conditioning in my cabin, and I doubt I ever will. If it’s ever too hot to be in my cabin, I probably wouldn’t go there in the first place. In your #2 reply, the phrase to frame the side openings, does this mean to have a four wall foundation? The size I was considering would be like yours since it would be a get away. I brought up the single mini-split as an idea to circulate air. They come in air heat and air conditioning in one unit. A neighbor has one in his home with solar and loves it. If you look at the pictures of my cabin you will see that I have two foundation walls, one in front and one in back. Each side has a 2.5′ x 19′ space that is open underneath. While I may someday enclose the open sides between the foundation walls, that will not make those side walls part of the foundation. They will serve no structural purpose other than as a framework to attach some plywood or siding. For air circulation I use a Vornado fan, although my summers are more moderate than yours. At the very least, I would close off the open ends of your foundation to keep out wildlife and make it more work for burglars. Skunks love to take up residence under houses and trailers, for just one example of an unwanted guest. And while rural thieves may not be smart or energetic, it’s a lot easier for them to use a battery-powered circular or reciprocating saw to cut an access hole in your floor from underneath than it is to cut off a good lock that is protected by a security hasp that shouds the lock. Rural thieves are also known to set fires when thwarted. An open foundation makes it a simple matter to pile some wood under one end of the cabin, add gasoline and ignite. Won’t take long in that case for the fire to penetrate the floor and ruin the contents. Even a dry-laid concrete block or stone wall at each end would be better than leaving the ends open. Put a couple of (screened) openings in to help keep the “basement” dry. Casting a wall at each end would be even better. I believe that my open foundation actually discourages wildlife from living under it. As it stands, there’s nothing there to protect them from the elements. My worry is that if I did enclose it, there would be more of an incentive for animals to try to get in. The critters around here are pretty determined and will dig deep to get into a place that they want. It’s also not just a matter of enclosing the sides, as the containers themselves have a number of raised sections on the bottom that would have to be filled. If I had to choose between cutting through the metal wall or the wooden floor of a container, I’d probably choose the metal wall. My container floor is 1.5″ of marine grade plywood that’s topped off with 1/2″ foam insulation, 1/2″ OSB, and finally a laminate floor. A small cutting torch is easier and quieter than either of those options though. As I’ve said before, if someone really wants to get into my cabin there are several easy ways to do so that I can’t prevent. This also applies to the scenario where someone could burn it down. Life’s too short to worry about and deal with every possible scenario. Thanks Steve. Now I get what you were saying. Check out IPE wood. It’s hard and insect resistant for that area as an option. Thanks again for answering my questions. Very cool web site and very creative work on the cabin. Great post which has obviously generated a lot of interest. I have always wondered if you regret not flipping the middle trailer opening so you got some cross-ventilation and sunlight coming in from more than one side. I love your layout though and flipping the trailer would totally change that. I know you considered that at the beginning and I wondered on how you find it now that you have lived with your cabin for awhile. Congrats on having your cabin in the Alaska magazine. What fun. It’s good to hear from you again. I still wish I could have flipped the middle container as it allows for both a better floor plan and better ventilation. Unfortunately my building site was not amenable to having the entry on the back side of the cabin. The best view on my property is due south, so this is where I wanted the windows and deck. The best building site also happened to be on the north side of the driveway. So, having the entrance on the main deck was a feature I wasn’t willing to give up. As someone who grew up around shipping containers (my dad was in the business) I have been writing about many of the point you have made here for years. It is so refreshing to see someone who has actually done it be so honest about it. This is a wonderful article and I will writing about it. I think your comment is valid depending on some variables. If you’re building on remote locations where limited materials and qualified workmanship is an issue, then containers will give you the chance to work where those resources (and some others) are available. In my case, I would have to drive 2.5 hours just to get to the location where I’m planning to install my cabin and then 2.5 hours back home. And let’s hope I don’t forget a tool or something! Let’s say I hire somebody instead of doing it myself. Inspecting the construction site is something to keep in mind. Right ? Even though I have skills in construction and furniture, The structural studies and plans I would have to pay if not using a container is a lot of money I can save or invest in my mod. The biggest loose end I have to tie is learning to weld, since it seems to be essential for building with metal structures. It sounds as though you’re considering building your cabin in modules where it’s more “civilized”, then shipping them to a remote location for assembly. I can see this as a benefit in certain cases, although there are some concerns you should be aware of. First, do not remove any walls of a container before they are welded to each other and/or onto a foundation. Doing so could cause them to come out of square and make your final assembly very difficult. Second, if you install spray foam insulation, as you should, cutting torches, plasma cutters, and grinders should not be used near exposed spray foam insulation as it could start a fire. Do keep in mind that you can also pre-build components for conventional construction and have them shipped to your remote site for easy assembly. You could also have the components transported in a shipping container for secure on-site storage during the build. The money you would save using conventional construction could easily pay for a couple of containers to use for shipping and an eventual garage/barn. So my thoughts on building with shipping containers would be more so having them at the ends of the structure and using as a closet, storage or bathroom. Make one door into the container with very little changes needing to be made. The strength of the container would allow a roof to be held up. Then just construct the front and back of house. In your photo, you have three containers side by side. I would have thought a structure four containers wide with only using two containers, one on each end. There is certainly nothing wrong with what you describe from a construction standpoint, although you would lose what I consider to be their greatest strength – security. This is why I have three containers side by side rather than a hybrid structure with conventional construction mixed in. At the point you’re considering a hybrid structure, why not just build all conventional and apply steel panels for the appearance or durability. Containers are much too expensive to use as siding. I also don’t find a reason to build with shipping containers whereas there are so many environmentally friendly materials for building and construction. Just wondering if using insulated containers would have helped with the final insulation costs? I also think that anyone who would prefer to use shipping containers over other greener, or cheaper, options are choosing to use up a tiny part of a massive resource polluting harbours and shipping locations around the world. Large scale use may seem the most effective way to get rid of stacked and racked containers, but even one person using them does make a difference. Consumers can change the economic landscape by what they do & purchase. People should get in on the ground floor of this movement, because once it becomes “a thing” they will be charging serious money for containers. IMHO Wait until some super star celebrity does it, and you have waited too long. After looking at the prices of insulated shipping containers on eBay, I can’t imaging how I would have saved any money on insulating. The spray foam insulation for my cabin was about $2,700, so about $900 per container. I don’t think I could have found three new insulated containers for $900 over what I spent on mine. Another problem with insulated containers is where to route the wiring and plumbing. Since the walls are already in place, you would need to rely on exposed wiring. While my cabin may look odd from the outside, I did want the inside to be as “normal” as possible. I’m a Brazilian girl rooted in Argentina, both countries have houses shipping containers as the solution of the moment for all housing problems. My husband and I were seriously considering investing on it, but after reading your blog, we are slowing a little bit with the idea…. Best regards from Sao Paulo and Buenos Aires. Don’t give up yet. Shipping container construction costs are region specific, and my numbers favor traditional construction only because I’m in the northern US where lumber prices are relatively low. In my discussions with readers in other countries I have found that their lumber prices can be so great that the balance tips to containers. A lot also depends upon your local climate. Do you need spray foam insulation, a separate roof over the container(s) to deal with snow loading, combined or separate containers? You need to run the numbers yourself to know for sure. I can think of one additional advantage – camoflauge. If you build without making major modifications to the exterior walls no-one will know what’s inside and your container is left largely un-noticed in semi-industrial areas. It’s a small point unless you’re trying out for your 15 minutes of fame on “Preppers” but properly grounded shipping container living spaces (as I hope yours is) make perfect Faraday cages. If you follow the grounding rules religiously, you should avoid electronics damage in either natural or man caused EMP events. My containers are properly grounded, but mostly for electrical safety and lightning protection. I was very careful when wiring my cabin to protect the wiring from any contact with the metal stud framing and metal cabin shell. Still, accidents can happen and you would definitely want grounding in place if the cabin shell was ever electrically energized. Wow. What a fantastic site. And how generous and thoughtful you are with your time and comments. I ended up her, wel I’m not sure how, but I’m considering a container for an outbuilding on my property in the Catskill Mountains of NY State. Eventually I would like to build a small stick built cabin and use this for strorage and building in advance = however after the project I was considering using it as a season guesthouse – are containers generally dry enough and okay for storage of wood – perhaps you already address this and if so I apologize – and again thanks – very inspiring. Short of a flood, a shipping container in good condition will prevent any water from getting in. The only thing I would like to know is what type of wood and how much you’re thinking about storing inside the container. Most shipping containers have two vents, one near the front and the other towards the back on opposite sides. Whether this is to provide ventilation or equalize the pressure during shipment I don’t know. My concern is that wood which is not completely dry, such as fresh cut firewood, would not fully dry out while stored in a container. I just don’t think the small vents on a container provide enough airflow to dry anything out. If the wood is completely dry, then I think it would be OK to store as much of the wood as you wanted. For my own cabin I always leave one or two DampRid buckets open to absorb any residual moisture that might be present when I close it up tight. Thank you for such a comprehensive outline of your personal build, and an honest appraisal of the downsides to container cabins. You have overlooked the main reason my brothers and I are considering a container hunting shack, portability! While we hunt on family land, we don’t own it and may not ever. A container cabin on piers ( no frost heaving down here) can be lifted and trailered to a new spot if needed. This assumes single containers with few, small cuts but we just want a basic shelter. If it was as nicely finished as yours EVERYBODY would want to go to the camp, Spartan accommodations weed out the “social hunters”. I have a question about using containers I have not been able to find an answer to. Does the design of containers allow placement of a 20 foot on top of a 40 foot? Doing this would let us have a storage area big enough for the 4-wheelers and other gear below and a bunkhouse above with a perfect space for a deck. But it only makes sense if the middle of the lower container is structurally strong enough to bear the weight without extra beams. The corner blocks of a 20′ will not align with the corner blocks of a 40′. Doing what you want would require some additional supports to be welded into place. How did you decide on an engineering company to help you out with the structural calculations. Are there many about who have experience with this type of build? The man I hired to engineer my beams and foundation has stopped accepting work for small container builds such as mine. At the time I was planning my build he was the only one I could find that seemed to know what he was doing. Unfortunately I don’t have any recommendations I could give you now. I’m so glad I came across your website and had a chance to go through some of your posts here. I’m most happy to have read this honest post. My wife and I have been contemplating about building a container home on a piece of land here in Phoenix – where the temperature gets upto 120F in the summer. Our goals were to save money + have a cool looking house and garage/studio space but from your calculations it looks like I might spend much more. I’m still not completely sold out of a container home BUT I reading through your posts I have started to think about conventional means of building over container homes. however reading more on the link above I learned that it cost USD 100,000 to build it. The details of this expense are unknown. I look forward to your new container home project posts. The home at the link you provided is definitely beautiful, but it’s nothing that can’t be duplicated through conventional construction and the judicious use of corrugated steel siding. If you like that house, you might be interested in the Rocio Romero series of prefabricated homes. If I didn’t have to worry about security and wanted a quick build it’s what I would do. Woah. I thought the cost of the Rocio shell would be more in line with shipping container shells, but woah…a bit pricey for just a shell. I just stumbled across your site. Well done and well documented. I could not agree with you more and we have a business trying to sell this idea. It turns out the building industry uses stick frame construction as the base line for a reason.. Yes a container is secure the day it arrives onsite but a stick framed build can be secure in a matter of a couple days if you are prepared and reasonably fast framer. This is our cabin we built in Northern MN (http://inhabitat.com/holyoke-cabin-is-a-beautiful-shipping-container-home/) and here is our blog (http://intermodaldesign.wordpress.com) that is not near as informative as yours. Bottom line, I like your honesty and ability to break everything down so well. Containers are not for everyone. Thanks for being level headed and telling it how it is. So glad I ran across your site….was thinking shipping container housing would be down and dirty, fast and cheap…what was I thinking? Back to the modular house plan….thanks for your honest appraisal of this kind of construction. The honest assessment of a container home, cost and all other factors. Thank you. This puts everything in perspective. Loads of folks think containers homes are cheap. This post should explain everyone’s doubts and questions on this subject. Helpful posts as the homes seemed to be more art than practical. I was thinking about using two containers (40s) as storage and to raise a house off the ground and build a stick build home on top with a car port underneath. The reason would be NJ shore. I don’t think they would float away with a house weighting them down but either a slab or concrete pillars would be in order. Cheaper? easier? any suggestions? From a structural standpoint it can probably be done, but you’ll need to consult with an engineer first. The only locations on a container that can support the considerable weight of a house are the corner blocks. Since a 40 foot container has these blocks 40 feet apart along the length, there will need to be additional support for the house and/or reinforcement of the containers. From a practical standpoint I think it would be great. I have seen at least one cabin built like this that I really like. While the cabin itself is not totally secure, the shipping containers underneath provide secure storage for things like ATVs, jet skis, etc. 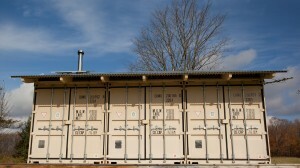 The next project for my property will be a storage building or barn built with containers that may be similar to this. I’ll probably have a post discussing this sometime this summer when I get closer to building it. To be fair, most contractors in stick built construction in this area are asking for over 100 dollars a square foot. My cost comparisons are based on a mostly owner built cabin. If your local contractors are charging $100/sq ft for conventional construction, which is not unreasonable, I guarantee they will charge you much more than that to build with containers. So what was your cost to use the containers and was this less expensive than a stick built cabin? Did you read my entire post and look at the charts? If so, I’m not quite sure what you are asking. THANK YOU for your experienced opinion on building with a shipping container. My folks have a piece of land in Colorado. They are permitted to have a “shed” not a “residence” (no water or utility hook-ups). In the past two decades They have lost three sheds to wildfires. Hopefully the shipping container will withstand a wildfire and wildlife break-ins. The first shed was sturdy, the second and third were built with impermanence in mind and that invited breach by bears and raccoons. We recently acquired a shipping container from a nearby property. It is a 40-foot “high cube” (9.5-feet high, as opposed to the more common 8-feet) The doors aren’t smooth operating, so we contend with that. There are a stunning number of containers in the hills for precisely two reasons: quick shelter and sturdiness. These will withstand fire, heavy snowfall, attempted breach by wildlife (bears and raccoons, mostly). My brother and I have collected insulation wool from refrigerators. It’s R-45 and free. Semi-rigid panels average 3×5 feet. We have also rescued three exercise cycles for conversion to pedal-powered generators. Since our sheds have always been available for use by X-Country skiers and rangers, we are being allowed to experiment with installing solar to create a no-freeze container converted from a chest freezer (or two or three), that my nephew realized would also make great elevated sleeping surfaces. We’ll keep jugs of water and first aid items that could freeze. Our real dream is to install radiant heated flooring that is powered by solar. We only want it to stay above freezing, but toasty would be an additional plus. We have already begun collecting Co2 alarms, oxygen sensors and tents that can be used inside the storage box. We have been exploring ways to prevent the unit from being too air-tight, without breaching its ability to keep much of the cold out. There is tons of data from arctic and antarctic shelters we’re finding very helpful, such as “huddle quarters” — spacious accommodations are not desirable in cold conditions. Looking forward to exploring your site to find out what you used, especially for encapsulating the treated wood floor. 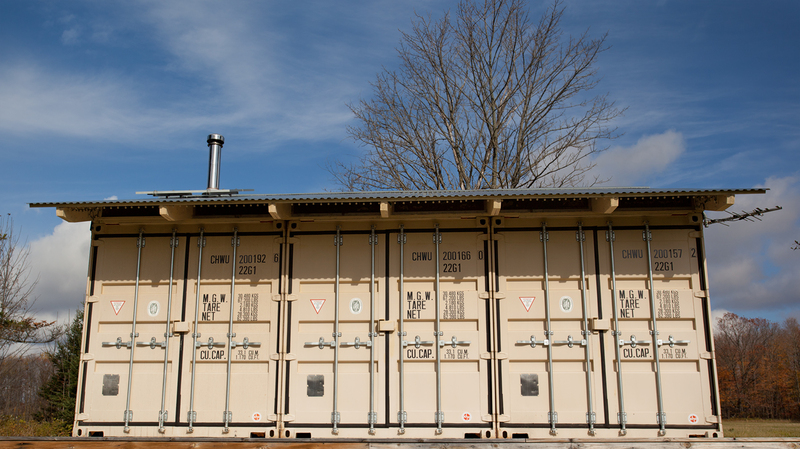 It seems you’ve found another reason to build with containers – protection from wildfires. I always recommend that container builders use closed cell spray foam for insulation, but I might make an exception in your case. Not being familiar with wildfires and how close your container might be to the heat and flames, I’m wondering if high temperatures could damage spray foam. In your case I would probably be more comfortable with fiberglass insulation, steel studs, and gypsum wallboard. Keep in mind though that your vapor barrier will need to be as perfect as possible to prevent moisture entering the wall cavity. I might also use a high-temperature foil-based vapor barrier such as those used in saunas. Your chest freezer warm boxes are an interesting idea and could be doable with a solar panel or two. Your radiant heated floor though would be impractical with solar electric panels, but solar hot-air collectors could do the job – except at night and cloudy days. Not cheap but you can also find homemade versions with instructions online that will only set you back a couple of hundred bucks. I really would like to see one of these in action on a cold day in full sun. Just wanted to mention that using containers for student housing is a very practical idea. Projects like keetwonen are great because they can withstand the punishment students put on housing and give students an awesome affordable option. I’ve seen Keetwonen before and there are several reasons it can make economic sense. First, it doesn’t look like they are removing any of the container walls. Second, they are stacked five high so roofing costs are shared among the five floors. Third, insulation costs are drastically reduced since the side walls of the inner units don’t need to be insulated to the level of the outer ones – if at all. Unfortunately it doesn’t seem as if the containers can afford much protection against the students. The walls and ceilings are paneled, and the floors are carpeted. The ruggedness of the container structure has been covered with less durable, but more traditional, materials. Considering some of the dumps I lived in while in college, I would have gladly lived in these. Unless the shipping containers will serve a purpose beyond what a traditional frame shell can, I don’t see how they can compete economically. By the time you frame and finish the inside, add piers and a roof, the containers are just expensive steel siding. The only way it would make economic sense is if somebody paid you to take their containers. Interesting to see the cost comparison and your thoughts on the whole build. Its crazy how much more expensive the shipping containers are compared to a standard cabin build. Apparently they have some of them in NJ to view, but that is a little far for us. Before we see them or make any commitment I wanted to get your thoughts…Do you have any experience with these modular containers? They are pre insulated and come with windows and doors, we can also connect them together with an additional accessory they have. Thanks for responding to the comments, its nice to actually see a conversation with the builder. The only thing those “modular containers” seem to have in common with a real shipping container is their size and shape. Shipping containers are constructed of 14 gauge corrugated steel walls sandwiched between an upper and lower steel box or i-beam. They also have 1.5″ marine grade plywood floors supported by steel joists in addition to lockable high security steel doors on one or both ends. These “modular containers” appear to be some type of panelized construction system using steel siding and a foam core wall. I doubt the steel siding of these modular containers is anywhere near the thickness of a true shipping container, but that may not matter to most people. For what they are, they are definitely interesting, and at about $20/ sq ft the price isn’t too bad for a quick setup shell. I would want to find out how rugged they are and how well they deal with rain and snow before I got one though. We are not too worried about the strength/thickness of the units as much as we are about its ease of use and building it out. The shipping container designs we’ve seen got us thinking, and this looks like a viable option (affordable, easy to set up, insulated). They are built with sip panels and seem to be pretty sturdy. And also its cool to have something that stands out from the ordinary. They sent us some of the load bearings and wind ratings, we would eliminate the flat roof, like you have in your designs. Thanks again for your insight. I wonder what you would consider a suitable home for someone that wants the ultimate in security from weather and intruders and low as possible cost considering you will need a contractor to do the work? I know this is what everyone wants right lol. I need help as a single woman. Thanks in advance. I appreciate any advice you can provide. These are difficult questions to answer as security and protection from the weather can vary considerably depending on your expectations and where you live. As for security, a shipping container cabin such as mine is only secure when the container doors are closed and locked. Windows are usually the weakest barrier to unauthorized entry, and installing bars or having them out of reach (i.e. a 2nd floor) are probably the best bet. As for weather, I would feel safe in my cabin during most anything except a tornado. If I felt the need for a home that was both secure and protected from any type of weather, I would build a monolithic dome with a high security door and bars on the windows. Unfortunately, the costs for a monolithic dome are even higher than container construction at around $130/sq. ft. I just bought a 40 foot hi-cube for mouse-proof storage. Cost was $3800 delivered, including sales tax. It’s sitting on log cants on gravel and every so often I’ll level it. Ultimately it will sit under an overhanging roof from a machine shed. It’s not possible to build mouse proof storage conventionally for that cost. The delivery driver said lots of hunters buy two 40 foot containers, separate them by 24 feet and put some trusses and a steel roof over top, and then spray foam the containers inside. Instant hunting shack. I’ve seen Minnesota craigslist ads for finished 20 foot containers for $13,000. These have doors and windows on each end inside the steel doors. They’re insulated and paneled with tongue-and-groove boards and have a mini kitchen and bunks. When you’re gone, just close the steel doors and lock them. No critters can get in. Mouse and insect resistance is definitely another benefit of containers. Although, if you merge several containers into one like I did, you do need to be careful in how you seal the gaps. I went through a lot of trouble to seal every gap and even provide a backup barrier of wire mesh or steel wool. I have not had a single mouse get into my cabin, and the only insects that get in are when I’m there and the windows and door are exposed. I have seen some of those barns/garages you mention, and they are a very tempting design to build. One of my favorites is shown below. All of these things you said are true but at the same time false, it really depends on what you want out of your living arrangement that’s will eventually affect how much you spend, the great thing with shipping containers is you can have them built off site and delivered as ready made cabins. This suits many of our customers in Australia who buy land in isolated areas and just want something dropped off ready to move in. In the end shipping containers are going to be used more and more for accommodation and i think they are going to be a trend that doesn’t fade away. Great article but in the end people like the look of container homes and the versatility! It seems you have found a niche market in your country providing pre-built containers for remote areas. There are several companies doing the same thing in the US, such as with portable hunting cabins for leased land, but that still does not change the economic realities of building with shipping containers. A properly built shipping container cabin will cost more per square foot than an equivalent framed structure in the US. There will always be good reasons to build with containers; security, fire protection, portability, etc. It’s just that cost is not one of them. If someone is willing to pay the premium to buy a pre-built shipping container cabin, I’m sure they will be happy with it. Businesses that do this type of work insulate the customer from the difficulties of building with shipping containers. My blog has always been oriented to the do-it-yourself crowd who may think it’s easier to build with containers. One of the purposes of this post was to tell them it isn’t. I really appreciate all the details you have given in the website and your answering the comments patiently. I also have a strange question – strange since I am from India and all the parameters you have mentioned kind of vanish:). I am planning for a tiny cabin in a small plot in the hills in the westernIndia (near Mumbai-called Pune). The weather pattern is extreme with 3-4 months of relentless monsoon rain followed by mild temperatures in 30s (celcius) and winter with hot days and cold nights (28-29 to possibly 4-5). Summer is the real deal with day time temperatures soaring to mid 40s. I am asking a portable cabin builder to fabricate the cabin for me. I understand from your blog that you are from north of US and apparently more worried about cold than me in India thinking of 45 C temperature!! But I would really appreciate if you (or any other reader who is from hot climes) could tell me what I should be looking for in terms of keeping the inside as cool as possible (mainly what kind of questions I should ask the cabin fellow). Electricity is available but intermittently (we have this phenomenon called power cuts!! ), so it will not be prudent to depend only on ACs. Any design insights (I am thinking of keeping a roof with bamboo and fibre glass sheets)? Thanks again for the informative article – I learned that I should surely ask the cabin fellow about grounding and floor covering!! The best advice I can give to keep a shipping container cool is to protect it from the sun. In your climate I would try to build a separate roof structure that the container could fit under. This would keep the sun from heating it up and would also prevent heat from building up under an attached roof. I built my roof with 3 foot overhangs and a large amount of passive ventilation to keep my containers cool in the summer months. I have opened my cabin on 90F days and it’s cooler on the inside than the outside. There’s virtually no solar gain through the windows or conduction through the container walls. It’s always better to keep the heat from reaching your building in the first place than trying to remove it after the fact. Thank you very much for the suggestion. I will surely incorporate a roof over the cabin now. Nandini – perhaps look at incorporating one of these..? Steve, neat post. My idea is not dissimilar to the picture you shared above on Nov 12, but with containers instead of stick built to preserve the strength and security aspect of it. I’ve not seen anyone use 40′ containers as ‘walls’ with 40′ containers cross ways creating a span of 24′ +/-. Wouldn’t this be the most economical way to create space? Two on the ground (or even stacked two high), and five across the top would create a lot of interior space and dramatically drop the cost per sq foot. Or at least, as I envision it. What am I missing? TIA. A similar design to what you propose was already done for the 2010 TRON Legacy movie. Search “shipping container TRON” on Google and you should see plenty of pics. With 40′ containers you will probably need to significantly reinforce the upper beams of the bottom containers to support the upper ones, but anything is doable with enough money. Hello Steve, thanks for writing all this information and your tireless answering of all the questions. One big reason for me for building a cabin in a shipping container that I don’t believe you have mentioned is the potential mobility of a container. Besides the design aesthetic I like the idea of being able to move it from place to place if I build the cabin into 1 single container. One thing I wanted to get your opinion on is if I cut a large opening for a large sliding glass panel door do you think that would weaken the structure to the point that I shouldn’t move it anymore? Also do you think a container structure would possibly twist when moved and cause the windows, doors, flooring, drywall etc to buckle and break or crack? Have you read anything on this or seen it done? I discussed this exact idea in my Tiny Container Cabin post back in 2011, but this type of cabin is even more of a niche building than mine. I do so want to build one though, but I also realize that it would be so small and crowded that it would have limited appeal. I also know the tiny house movement is very popular right now, and there are a lot of people willing to live in these small spaces. If I had to permanently live in one it would be a 40 footer with large sliding glass doors on either side. The living room and bedroom would be on either side for the natural light, and the unlit center areas would be bathroom and storage. Anytime you remove a portion of a container wall you will weaken the structure. The question is how much are you weakening it and will you need additional reinforcement. I would always err on the side of adding reinforcement to the lower I beam and upper box beam in these situations – especially if you’d be moving it. In regards to the building materials being able to handle a move, I did speak to someone who built a single container cabin with drywall and a sliding glass door. I asked the same questions you did and was surprised to find out that he didn’t experience any problems. I would make sure to use wood studs and many more fasteners than is typical with a stationary structure though. Wow! Glad I stumbled onto this. Thanks for the comparisons. I have just a couple of questions. 1. Where 2 sides join together I’ll assume you cut doorways or remove some of the sides to open up the space. Did you foam insulate between the sides? 2. Did you insulate the bottoms on the outside? 3. If you were to run electricity or plumbing did (or would) you run it thru the interior framing or use channeling along the baseboards? First of all I’d like to say you’re great for not just sharing your initial thoughts but for taking the time to respond to everyone’s individual queries. Great stuff!!! I’m an architect and I’m currently in the process of moving to the us and hoped to build a shipping container home…. I must confess partly due to the artistic possibilities… Great cantilevers that are not really possible with conventional construction easily but also what I’ve heard in terms of construction times through pre fabrication and the reduction in a lot of costs including traditional ground works, walls and roofs etc. I still need to do a lot of research as I’ve not built in the US previously, and its been many years since I even designed a residential property but I’d like to say this has been really great reading and very informative. At the moment I have very grand plans ( using up to 8 40ft containers) and just designing, detailing and project managing rather than doing much of the work myself. I was just curious if you had any thoughts on the willingness of contractors to take on an ‘unconventional’ build, and also if you think the costs would change significantly on a larger scale build. I’ve been led to believe that if you opt for cheaper building blocks … Containers… to provide the initial structure and enclosure it will leave more for quality finishes? I understand a lot of extra steel will probably be needed to make some big openings but it still seems to me to build a traditional masonry 4 bed house that the cost of shell and core alone would be much greater than if done with containers. I’d be building in Texas by the way and I’d be really interested to hear your thoughts. Ps I understand you’re blog is more DIY based but you really seem to have a wealth of knowledge on this type of construction that I’m really not familiar with and any advice would be great. Thanks again, Sophie. Yours is a difficult question as I have no experience with such a large scale build. I also don’t know what the costs would be for a masonry structure as I’m most familiar with frame construction. I do think that what you want to build will probably be more expensive due to the extra engineering, architecture, steel reinforcement, and so on for a cantilevered structure. It all comes down to what you are willing to pay for a certain look. I also don’t think you will have too much trouble finding a contractor to build it for you. There’s always someone willing to take your money to build something, although it might not be at a price that you like. Along with everyone else I’ve thoroughly enjoyed and found your information eye opening regarding the cost and I love the design. My only thoughts regarding the cost of the container vs. normal construction are: it doesn’t seem you give any credence to the fact you also realize the material and labor cost for the floor framing and 3/4″ T&G sub flooring. It seems to me that the three container design adds additional cost since you loose both side walls. I’m not sure one could frame the floor through the sub floor and install exterior sheathing, nails. construction adhesive, tyvek and conventional siding for the cost of two new containers. Still security is still the biggest factor. In my calculations for traditional construction I included a concrete slab with 2″ foam for insulation. I could easily have chosen piers, a framed floor, and batt insulation at even less cost than a slab. I also don’t think I saved any time using containers rather than a framed floor – framing and sheathing a floor is actually pretty easy. I stand by my numbers that traditional construction is significantly cheaper, and less time consuming, than container construction. What a great article. I own a tiny home and help promote them (tubular steel and foam modular). Lookyloos come into the display model and mention the ‘free’ shipping containers and how much they could save. There have been a few articles here (B.C. Canada) about using shipping containers to house the homeless – but they stated it would cost around $80,000 per unit – not exactly cheap. It’s nice to see an actual cost comparison, good on you! I really like the homes you are building – kind of a supersized tiny home. The floor plans are nice, and the finished price is also very reasonable compared to some of the tiny homes I have seen. The only suggestions I have would be some sort of entry way mudroom or closet, and maybe a bit more contemporary design on the outside. Dose your house shift around/ move — heat/cold – any weird noises ?? Also why did you put the 2 round cement pillars in the middle of foundation ?? Would you put then there again ? I think you’d be pretty safe where you are with fiberglass insulation. You might even want to consider NOT including a vapor barrier. My worry would be that if any water did get behind the vapor barrier it would have no way out. You should probably talk to a local builder that’s familiar with your climate before doing this though. My cabin has not shifted and I haven’t heard any weird noises from the cabin itself. It has however amplified low frequency sounds such as large fireworks. The pillars in the middle of the foundation were recommended by the engineer of my cabin to prevent the floor from sagging since I removed the inner container walls. I very much appreciate your documentation of your container home. You may have answered this elsewhere, so forgive me if I am going down a road already traveled. We are planning on a summer retreat in the northern states. We intend to spend only May-Sept in this get-away. My husband is a professional builder and can do most, if not all of the work himself. I don’t know how much $$ you invested in contracting labor. Can you share that information? Thank you! It’s hard for me to separate most of the contractor costs from the materials they used. Most of the contracts were unwritten and “signed” with a handshake, so I didn’t always know what the materials costs were. It’s funny that the only problem I had with a contractor was the one that wanted a signed contract. Really glad to see an HONEST engineering CBA included in this site! From my other comment regarding construction in The Philippines I was literally laughing out loud when I read “Security” and “Surviving a Cat 5 Hurricane”! Having gone through two super typhoons in less than a year (and who counts all the Cat4 “Babies”! That is prime in my mind…having had my roof semi-removed in the last one! I worked in “The Katrina Zone” and remember shipping containers that were battened up and literally floated around… So anchor well, eh? Of course, I snickered at “third world plywood floored shack” as well… Basically that’s what I have now, the containers will be a step up…and security for my tools when traveling will be less of a concern. Sounds like the Philippines is the perfect place to build with containers. While my containers might withstand a hurricane, I’m pretty sure that my roof would not. We do have a few tornadoes up here, but the likelihood of getting hit by one of those is very remote. BTW, plywood floors can actually look very nice. The real problem is when they are unsealed container plywood floors with pesticides in them. For the difficulties in cutting the shipping containers and building with them after having a 40′ container (and still have one) personally i would prefer to look and feel and ease of building with regular wood. But the shipping containers are super cool for how secure and solid they are. I have used one with simply some furniture put in and a side door cut in and a wood fire installed through winter and it heats it well. Had nothing else other then the container itself, no insulation, no windows etc. Just the 40′ container and a side door cut in the side! Good man cave, but in summer here in Australia even though it’s partly shaded under a tree they get too hot to be in. You must insulate them really. I am seriously thinking of building a cabin with normal materials, wood, corrugated iron etc and just using the shipping container for storage! 1. Secure storage of tools, ATV’s, etc. in the shipping containers. 2. Simplified, or even no, foundation depending on your soil type. 3. Traditional low cost construction for the second story cabin. 4. Protected carport/work area under the cabin. 5. Built in shading of the storage containers below. Steelmaster and other steel building makers who use similar rolling machines (the patent apparently expired long ago) make Galvalume-coated ISO container covers which incorporate ISO containers under one or both sides. No wood, easy to erect (I have a small 20×20 Steelmaster and they are a breeze to put up if you use an air ratchet) and easy to modify. Users in cold climates often spray foam the interiors. The “bridged container shop/barn” style is common and works well. I have two joined 40-ft High Cubes as shop space and while I’d live in an ISO house I’d outfit it like industrial/military containers and add a Steelmaster at leisure. They are a niche market item. I wouldn’t contract it out for my use case but any metal fabricator could do one at near zero paid labor cost. If you already own an “overkill” level of metalworking gear you can drop a pole, fire up your welder and air compressor and rock and roll. I recently found Great Stuff Fireblock spray foam and it has a handy use in my case. i’m going to be welding a 2″ x 1/8″ thick strip across the bottom of a man doorway between containers but not at the moment because they are already full of gear. I foamed the open joint to maintain seal (I like my tools kept dry which makes containers ideal) and when I hit it with an angle grinder prior to welding the excess Fireblock will easily crumble away. No risk of conventional foam turning into “napalm”. Ventilation while working on the inside is accomplished by a “bounce house” centrifugal fan from a yard sale. Lots of high velocity air in a narrow stream. It throws an impressive amount of air. Such a fan would be excellent for venting insulation foam outgassing, as would other portable centrifugal blowers like those used for drying carpets after cleaning. I wear a respirator when welding, painting, or grinding of course. PPE is cheap. Health problems not so much. When I was first designing my cabin I contacted SteelMaster about the exact roofing system you mention. I was shocked by the price, which was many times greater than my pole barn style wood frame and metal panel roof. I’m currently planning a small container barn build this summer and looked into a less expensive, and also less substantial, metal roof system sold by VersaTube. Even this cheaper system cost more than double what I could build my own for. Great idea using the Fireblock spray foam. This is the go… the best of both worlds! Question: since the corners are the load bearing points for containers, did you run a long stringer (glue laminate beam or something) from one end to the other as your primary roof support beam, and then set all your trusses on top of that? We would like to cover our storage container with refurbished wood. Any suggestions on how to connect the wood to the sides? The easiest way that I have seen is to bolt 1×4 or 2×4 wood “studs” on their sides through holes drilled into the container walls. These will then provide the nailing/screwing surface for the siding. If I were going to add insulation to the outside I would choose a 2″ or greater depth to make room for some foam panels. Be sure to use flat head bolts or countersink the holes so the siding will lay flat where the bolts are. Also remember to use vertical studs for horizontal siding and horizontal studs for vertical siding. This article is fantastic. I haven’t seen one with this much in-depth information. Definitely answered many of my questions. I generally agree with your point. I built a 1000 sqft stick built home and generally came out better, in terms of financial numbers, than if I tried to build a similarly shaped shipping container home. The biggest problem I see with most people’s approach to shipping container homes is they want something too complex. If you take three shipping containers and then cut out most of the sides, a lot of the value of the shipping container is being cut away – also cutting and metal fabricating has a cost. The remaining shipping container is cheaper shape could be easily constructed for the same cost using lumber. That all said, I am in the process of creating a small, 20′ shipping container cabin in AK (I like having small living places around the U.S.). I plan to keep it simple in terms of what I cut out. I will leave the two main doors. I will open these up for the season and have secondary doors just inside. I will leave the shipping virtually intact. This will be a cost effective structure. Being in Alaska, and in a place I will only spend part of the year, being able to secure it while I am not there is major consideration. Plus, I am considering doing most of the build here in the lower 48, load the container with things I want in AK (fishing poles, tools, etc) and having it shipped to my AK land, having already poured concrete supports for it and setting it on foundation as soon as it arrives. Shipping container are absolutely cost effective – as long as someone doesn’t want a complex structure and works with the original dimensions and strengths of an uncut container. I’ve been using a 20′ container as a trapping cabin for a couple of years now at my (extremely) remote property. It was convenience plus security that sold me. I barged it down and then used a winch and a number of logs to move it into place. It isn’t nearly as fancy as some of the others, but the stove works and I won’t ever have to worry about arriving at the cabin and having the door broke down and food stocks raided. Informative post. I’ve been looking for realistic articles on the true costs for converting a storage container (so far I’ve only found the idealistic articles). My husband and I, in the near future, are planning on moving to a tropical part of Mexico with my parents who are retiring and the security of a shipping container home is very appealing to us. I have also always been intrigued by this idea and I’ve always wanted a small house made with resuable materials. My husband has experience in construction, roofing, plumbing, concrete work, tile, HVAC, electrical, welding etc and we would do most of the labor ourselves. In your cost graph, did these numbers include paying for labor or was this basic materials cost before labor? 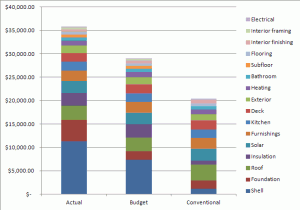 The cost graphs include everything, including labor. Unfortunately I was not able to separate out the labor from the materials for the work that I contracted out. I think it depends on what you are looking for in a home. If you are looking for a more traditional style home, you wouldn’t even be considering a container. It’s most beneficial to those who want that modular look and can use the containers to their advantage. It’s also not as “cheap” as most people think, but it is less expensive. It’s just not for everyone. Please share with me how you can build a shipping container home/cabin for less than the cost of traditional construction. I’ve posted my numbers and stand by them. A properly built shipping container structure will almost always cost more than an equivalent traditional structure. Im new to this thread but I’m really enjoying it. I’m thinking of constructing a container home using 2 40′ and 2 20′. I will be doing most of the work myself…what I can’t do, ie electrical, I have friends to help with. I’m most concerned about the insulation and now the flooring. I planned on using the original flooring and applying several layers of epoxy. How many layers did you use in your cabin? Also I will be living in the home year round, I live in southern Ontario. I had hoped to use pier foundation which I think will be the most economical. Do you know if this is doable in south Ontario? I applied two layers of epoxy to my floor after an initial solvent wash with Isopropyl Alcohol. I encourage you to read my post, “The Floor Dilemma”, for the full details. What foundation you choose to use depends on many things, especially the soils in your area. You will need to talk to someone who builds foundations in your area to be sure. As someone who’s looking for a relatively cheap ($55-75 sq ft) off grid home, and has been considering containers as an option, your insight has been very helpful. One thing I would like to know, and haven’t seen addressed on any container home sites is the longevity of the R-value for spray foam insulation. I worked in the ice cream industry (mmm… industrial strength ice cream) and one of the problems we had was the degradation of the urethane foam in the reefer trucks. Eventually the truck could barely be classified as “reefer” at all. This was many years ago, and I haven’t kept up with insulation development for about 2 decades. I’m curious to know if a value of R-19 will still be R-19 in X years; and if not are there tables that predict the decline of the R value over time? If I haven’t taken up enough if your time already, any knowledge on foil facing sprayed insulation would be much appreciated. Thanks in advance, and thanks for the time you put in here. Happy Holidays as well! I have seen lifespans listed as 25 years, 100+ years, and even indefinite. Whatever it turns out to be, I probably won’t be around to have to deal with it. I would think one of the problems with reefer trucks would the the constant vibration damaging the insulation. I am pretty confident a static structure will hold up much longer than one traveling the highways. In regards to r-value degradation and foil faced sprayed insulation, I do not have any knowledge or experience of them. I’m looking build a cabin in my urban backyard and use a shipping container for one reason, racoons. The city won’t allow people to harm them so they run riot in Toronto. Pest resistance is another advantage to containers, although well thought out and built traditional construction work well also. Unlike my old cabin I have never seen a mouse, and I also don’t have the problem with cluster flies as before. About the only insects that get in are a few from the firewood, and the occasional hitchhikers on us and the dog – think ticks in springtime. Well, my 2 cents opinion: shipping container housing is only cost effective if they are mass manufactured for 3-5 storey building using modular building techniques of basic finishings like plaster wall and ceiling with vinyl sheet flooring. They are much quicker to complete, especially sensible in developed cities where labor costs are rocket high. It’s funny how your case mostly against shipping container homes has sold me on them. First off, I would like to use several awning windows along the sides. They will be mounted at eye level, and small enough in size to maintain security. What would be the largest size awning window you would recommend before someone could squeeze through one? How spaced out should I place them in order to maintain structural integrity? For external insulation, I am wondering how a shipping container would react to wall ivy. Ivy would help shade the metal from the sun, as well as absorb moisture to prevent corrosion. It will stick to the paint, so it might be a pain to remove. Is there any way the ivy could penetrate or damage the container? Lastly, I am going to be building a single container home, so my greatest concern is width. My current floor plan was originally designed for a 8.5′ THOW. As you can expect, I will lose about 6″ using a shipping container instead. I have a way to save 2″ off the bat, so I am mostly needing to cut 4″. The easiest option is to cut the hallway from 36″ to 32″. Most interior doors are 32″, so luckily I won’t need to buy an expensive custom door. The second option is to cut the shower from 3’x3′ to 32″x32″. The last option is to split the load, and do 34″ all around. Which would you prefer, if any? I did some research, and you would be surprised at how small of a window some people can squeeze through – sometimes less than a foot in height I think your best bet would be to take the metal you cut out for the window and create a shutter that can be secured into place when you leave. I don’t think Ivy could damage the 14 gauge Corten steel of a container. ON the other hand, the Ivy will damage the paint on the metal walls. If you ever take the Ivy off you’d need to scrape the Ivy attachments off and repaint. A better option would be to secure a wire mesh several inches out from the container walls. The Ivy can grow on the mesh and also allow for an air space between the Ivy and wall for better cooling. My philosophy on design is to reduce the space that you will use or see the least. A 32″ shower is more than adequate in my opinion, and also consider how little time overall you’ll be spending in it. I would rather have the extra space in the hallway, or even dedicate that 4″ in the hall to some shallow shelving. I have seen some nice kitchen and food storage systems using 4″ shelves. I found this post very informative and have read all the comments and seems that perhaps you are going to be modifying another Shipping Container and turn it into a cabin or home, or some such. Since you only see a limited number of reasons to build with shipping containers, why do it over again? Thanks so much for doing this detailed analysis for us! I am considering building a 1500 square foot house using three 40′ high cube containers with two of them similar to the barn ideas you showed with a 16 foot separation in the middle that will create a large open space. I wanted to ask you about your decision to stay away from pier foundations. I am located in northern Illinois and am considering using 16″ pier foundations below the frost line with four per side on the containers. I see piers used a lot on these containers and just curious if I am missing something that I need to consider. Also I am thinking about a low slope membrane roof on top using I joist rafters. Our snow loads are not too bad, but do you think a low slope roof could be a mistake? Thanks again so much for your site! I appreciate your honesty. I have to look at what else is behind building container houses, and it must be it is more profitable to sell used containers than to sell them as scrap steel, so I can easily imagine that that is the prime driver behind all this green talk about steel container homes. Never the less; I do respect the strength that they are capable of, and if mounted correctly, could be tornado proof for one, earth quake resistant, and could even be flood proof if some submarine technology could be applied to it. I do wonder about lightening, if all that steel might be quite attractive to lightening. Being properly grounded would be of an essence I believe, and a grounding rod would need be tagged to all the rebar in the concrete, and the rebar to the crates. I would also think that a real good surge protector might be a sound purchase, and not to run the wires right next to the steel, but away from it, in plastic, water proof, air tight conduit. I think that to build with this much steel at this time is still a bit out of my league. Everybody knows that it is more expensive to build with steel. With wood, I can make a house pretty much as secure as steel if I make heavy duty shutters for the windows and the doors, and lock them for a get away. Regular stick built houses are much easier to design, and there is complete freedom to move anything anywhere. With steel crates like this though there is such a capacity for strength that would stand up to a whole lot more than a stick built home, and that is very well worth a lot of consideration, so I have not ruled it out yet. Everyone could laugh at the man who built with containers, but when a major devastation comes along that destroys most everything else around it, and it remains standing, I think a lot of people would stop their laughing. No one yet though has touched upon the cavity that must exist between the floor, and the bottom sheet steel of the container, and the best way to deal with that, as well as any cavity there is under the top of the container as well. For people who want to sell their containers, I have not seen any real structural analysis of them. I do not think I would ever work with a container without a full blue print, along with structural recommendations for working with it. You just can not guess at something like that, and over killing could be overly expensive. Very interesting article! You’ve done some amazing work and research! I’m currently in the works on building a shipping container home and I agree with most of what you’re saying. A few things you might not have taken in consideration would be the “prefab” aspect of construction (I.e. Building the parts of the home in a controlled industrial environment where quality can be to the upmost importance then shipped to the site). The structural properties of a shipping container are as you said designed to withstand a category four huricain and as long as it is not compromised, even though the cost might be higher the longevity of the building will be much greater to a traditional wooden construction. Also the hybrid construction of shipping containers and traditional buildings (as I’m designing). As a welder and general contracter I’m in a uneak situation as I will be doing most of the work myself, it just seemed like you focused on one type of shipping container structure than exploring the different hybrid types. That said, all you have brought up is true… especially cost wise… but there are ways around it! I really enjoyed your article! Thank you for helping with my construction. I am in the framing stage, about to put up insulation of my 40 ft X 9.5 ft container home. I have searched and looked at different floor plans, and have ultimately designed a secure, sufficient one bedroom, bath, kitchen, and sitting area. Good day and welcome to my blog . I’m Eliot. During the summer, I started doing academic writing for students at the local college. It helped me have fun that summer and even funded some of my college tuition. Today, I still offer my writing services to students. For me the advantage of building a container cabin is that my property is so remote and getting the labor to help me build it on site was cost prohibitive. By building the containers locally, prepping them and hauling them to the site, I actually saved money in labor and the lodging of laborers . Nice Blog!! The content you have shared is very elaborative and informative. Thanks a lot for sharing such a great piece of knowledge with us.